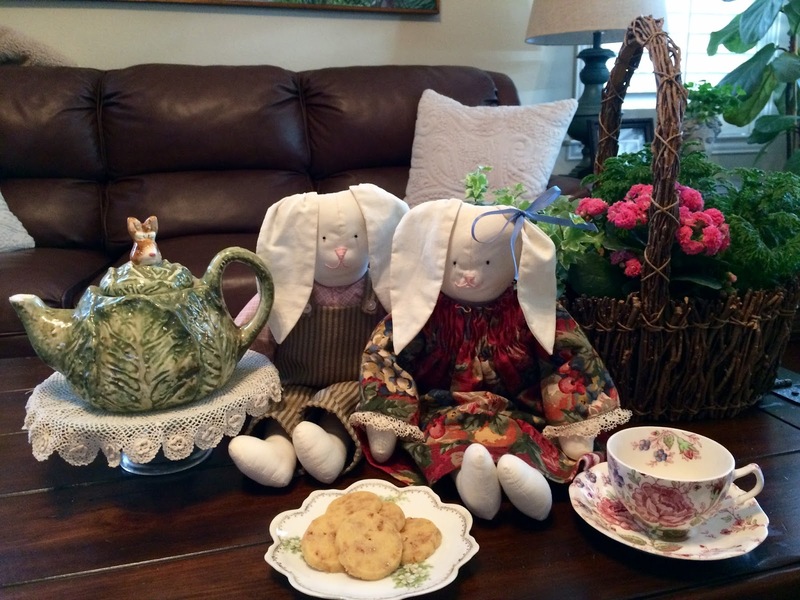 Let's join my Mr. and Mrs. Bunny, that I made years ago, for a tea with some shortbread cookies. 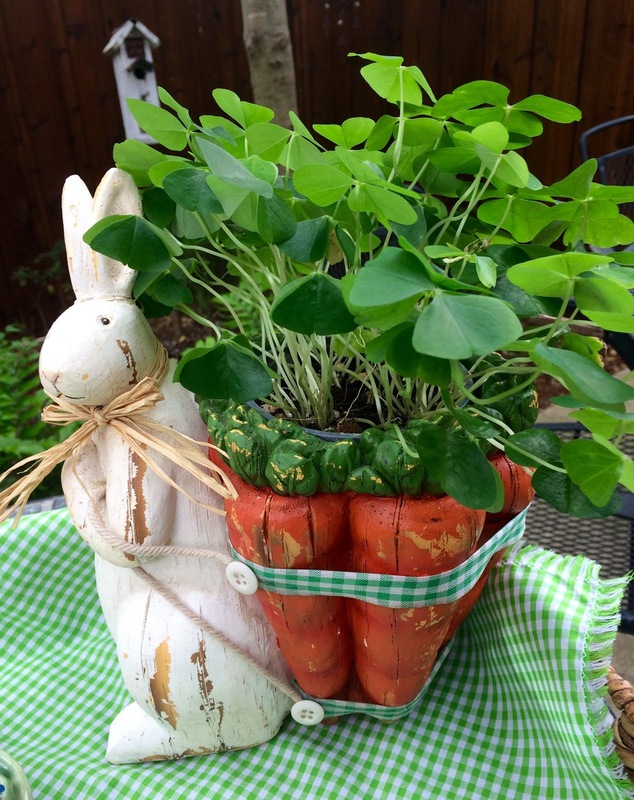 I always love getting out my cabbage teapot with the bunny top. My Mom gave me the pretty plate. 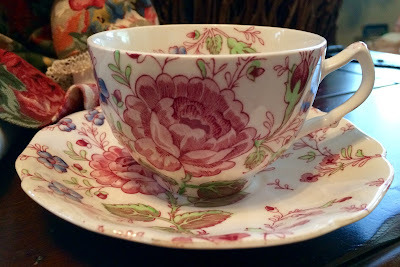 I thought my Johnson Brothers Rose Chintz teacup looked so pretty with Mrs. Bunny's dress. 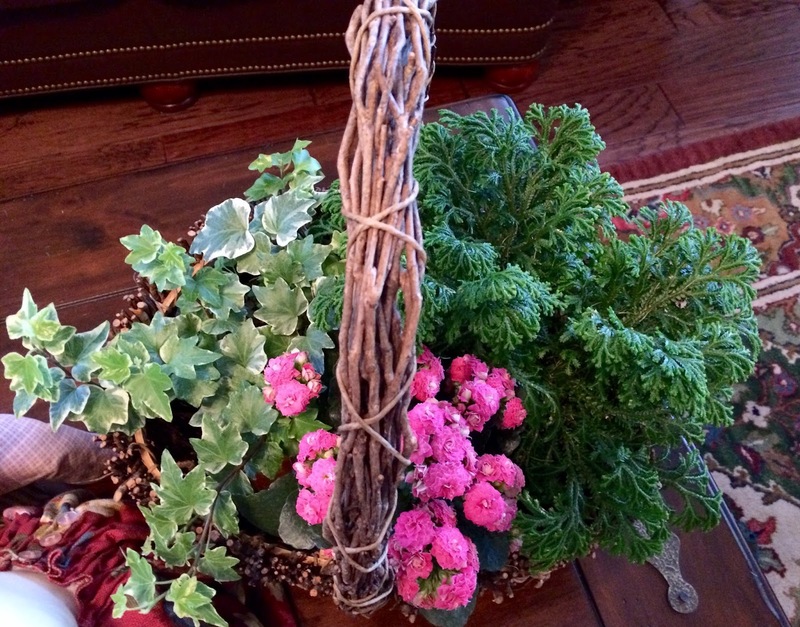 I have kept this basket on my coffee table for so long. I love changing out the plants for some seasonal decor. Right now it is filled with pink kalanchoe, variegated ivy, and a new-to-me plant, called Selaginella Kraussiana , which looks like a little arborvitae to me. I'm going to try taking cuttings from it and see what happens. These are perfect little cookies to serve with tea or coffee. I sliced one log and froze the second to use for later. Gradually add powdered sugar, beating well. Add vanilla and mix. Combine flour, baking powder and salt. Add to butter mixture, beating on low speed. Stir in toffee bits. Divide dough in half and shape into 10" logs. Wrap in plastic wrap and chill for 8 hours. Cut each log into 1/3" slices, and place on parchment paper or silpats. 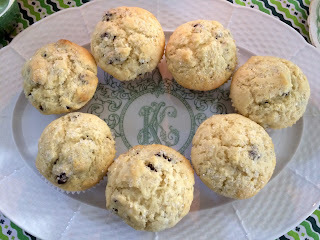 Let's have some Irish Soda Muffins with some Irish Breakfast tea today! 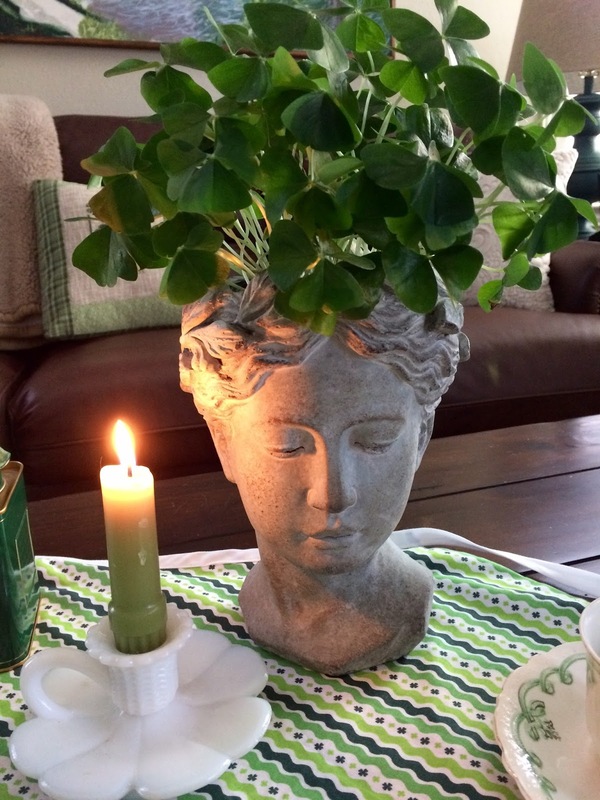 This pretty lady head planter that's sprouting shamrock plant hair was a recent purchase from a local nursery that I bought with a 30% birthday coupon. The table covering is actually an apron that my dear friend, Barbara, sent me, and it's reversible! 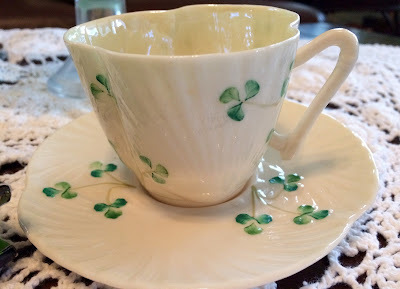 The milk glass shamrock candle holder belonged to my maternal grandmother, and I just love it. 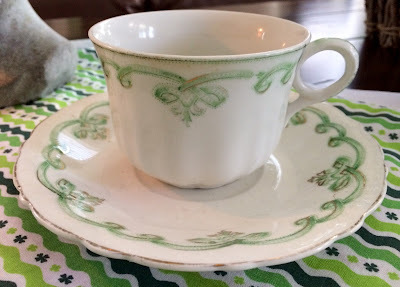 I so enjoy using this Johnson Brothers Rolland teacup that looks like it has Celtic knots all around. 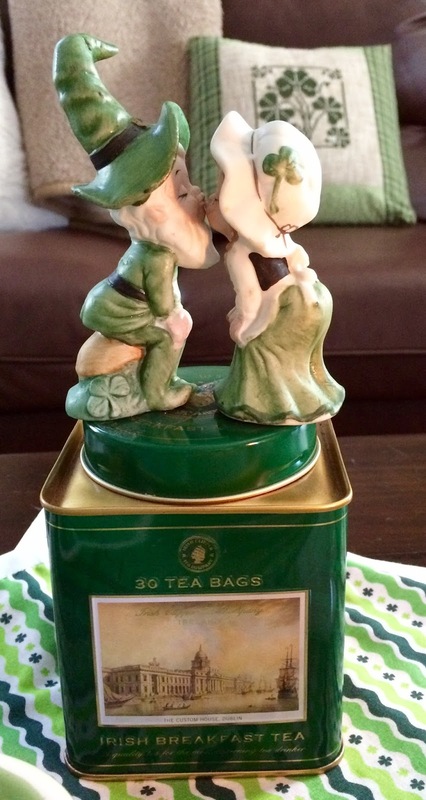 It goes with so many of my things. My mom gifted me with this leprechaun couple years ago, and I perched them on top of my Irish Breakfast tea tin, that I saved from my late hubby's and my vacation in Ireland. 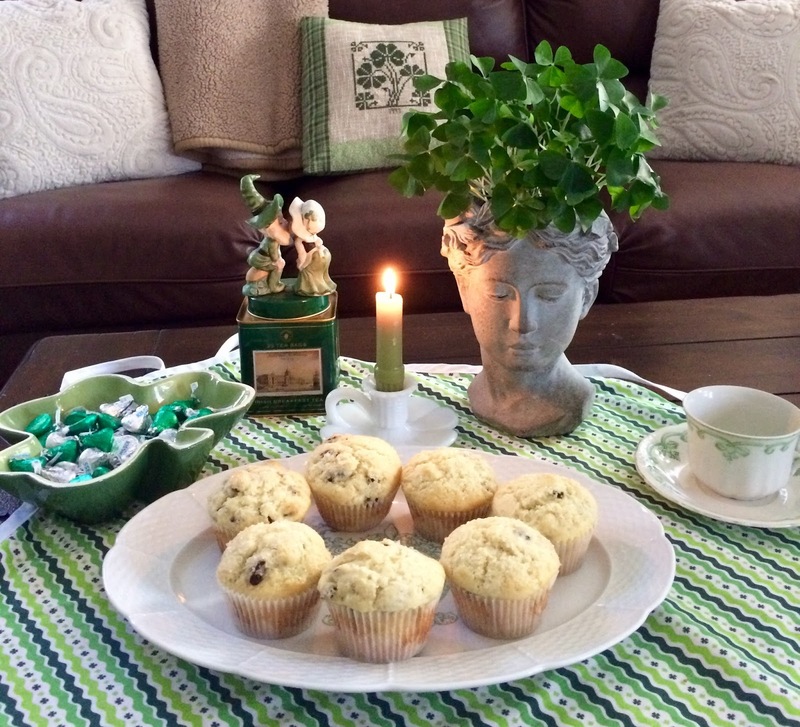 These muffins are the perfect St. Patrick's Day treat, and are great spread with some Kerrygold Irish butter. Preheat the oven to 400°F. Lightly grease a standard muffin pan; or line with papers, and grease the papers. In a medium-sized mixing bowl, whisk together the flour, baking powder, baking soda, salt, sugar, currants or raisins, and caraway seeds (if using). In a separate bowl, whisk together the egg, buttermilk (or equivalent) and melted butter (or equivalent). Quickly and gently combine the dry and wet ingredients; honestly, this won't take more than a few stirs with a bowl scraper or large spoon. As soon as everything is evenly moistened, quit; further stirring will cause the muffins to be tough. Spoon the batter into the prepared pan, filling the cups about 3/4 full; the stiff batter will look mounded in the cups. Top with sparkling white sugar, if desired. Bake the muffins for 20 minutes, until a cake tester inserted into the center of a muffin comes out clean. 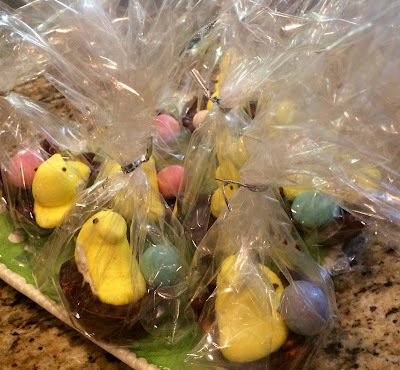 Remove them from the oven. Tip the muffins in the pan, so their bottoms don't get soggy. Wait 5 minutes, then transfer the muffins to a rack to cool. 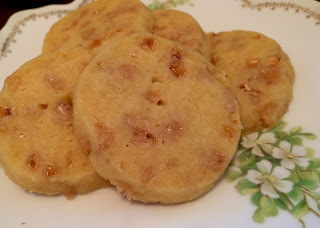 Serve them plain, or with butter and/or jam. My darling daughter, named Molly Colleen, came over for lunch. Can you see my Dollar Tree shamrock lights around my flowers? 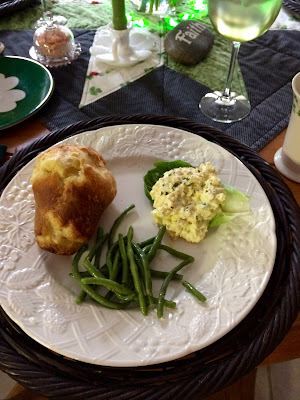 We started with some Irish cheddar cheese and crackers, her favorite egg salad, and popovers, another of her favorites, along with some haricots verts. I whipped some butter with homemade jam for us to spread on our popovers. Of course, we had a pot of Irish tea, and just enjoyed being together. 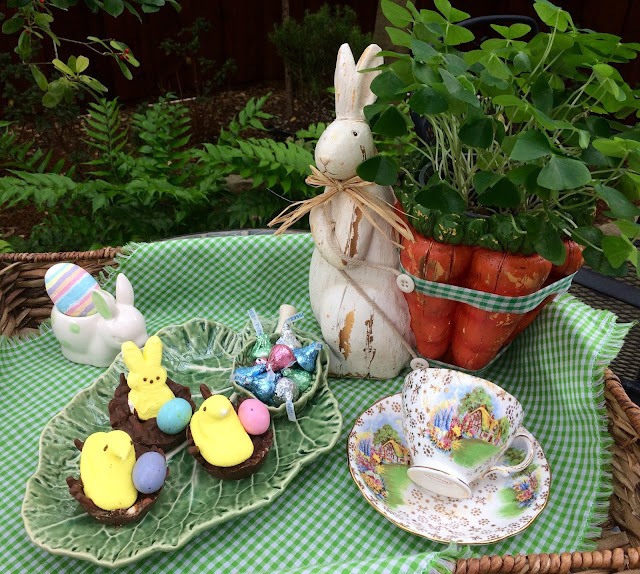 The recipe for the popovers can be found here. Years ago, Molly won a $1000.00 gift card to Neiman-Marcus, and although she bought some things for her home with the money, a great deal of it was spent on us going there for lunch. That's where we discovered the best popovers ever! 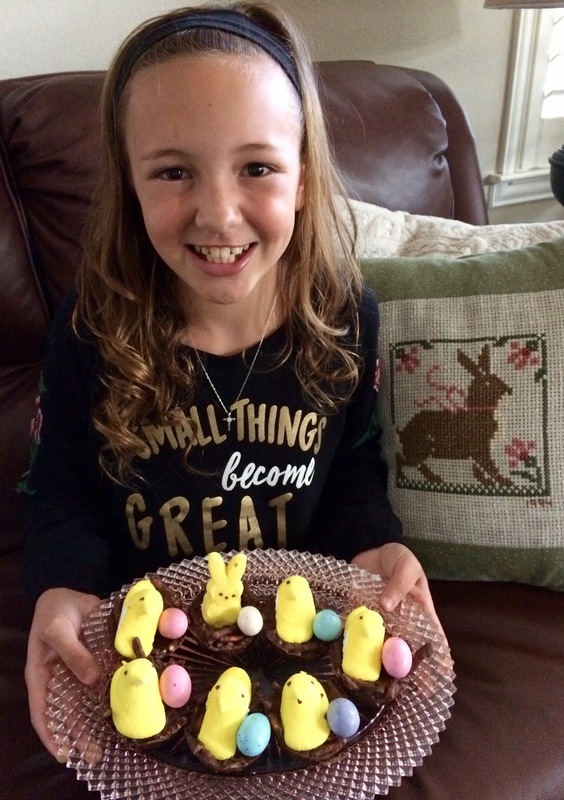 My granddaughter, Cissy, and I got a head start on some St. Patrick's Day baking. 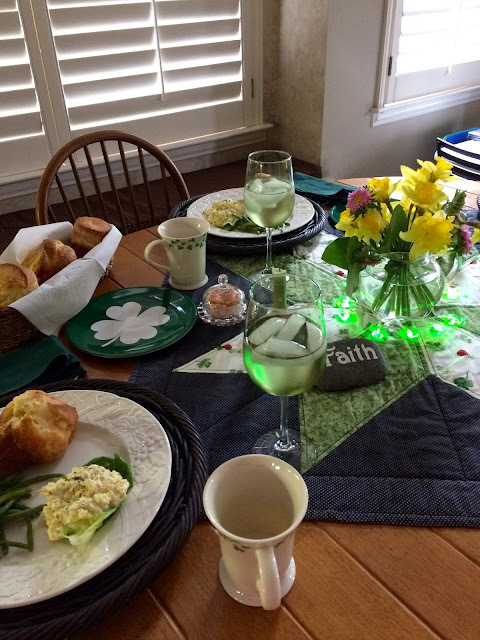 Let's have some Shamrock Spritz cookies with a cup of Irish Tea, shall we? 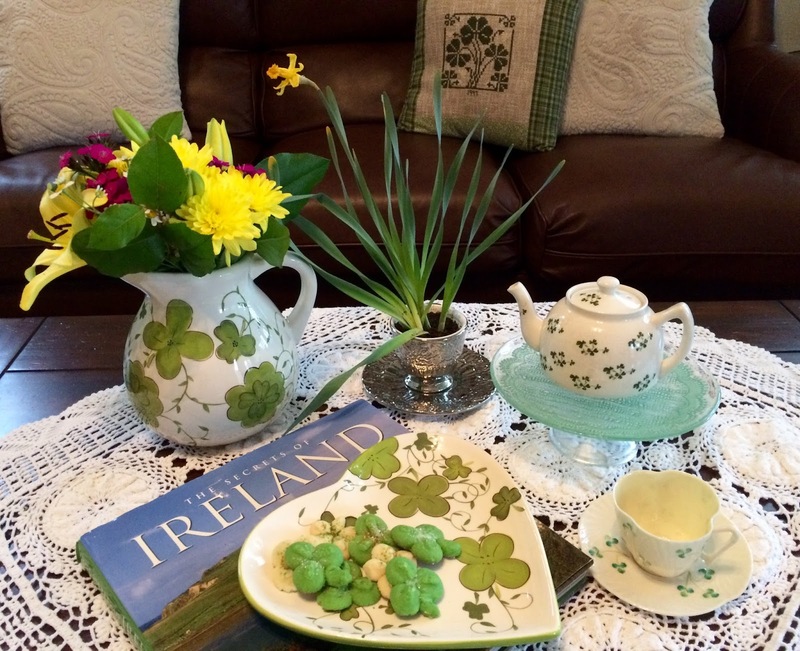 We can look at my book on Ireland and admire the pretty flowers that I received for my birthday, which was at the last weekend in February. 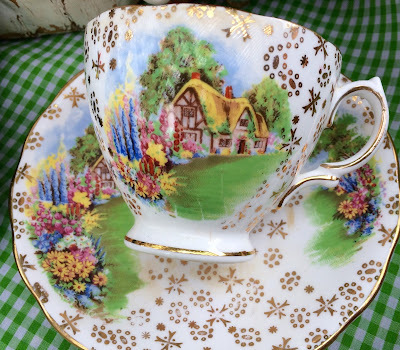 The mini daffodil was planted in a sweet little teacup, from my friend, Bea, and the bouquet came from my friends, Joy and Rodger. 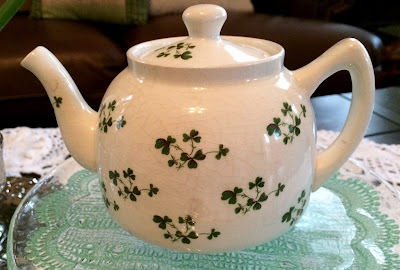 I always love using this teapot that I found for $1.50, which says County Cork, Ireland on the bottom, where my paternal great grandmother was from. It's always nice to bring out this Belleek teacup during the month of March. 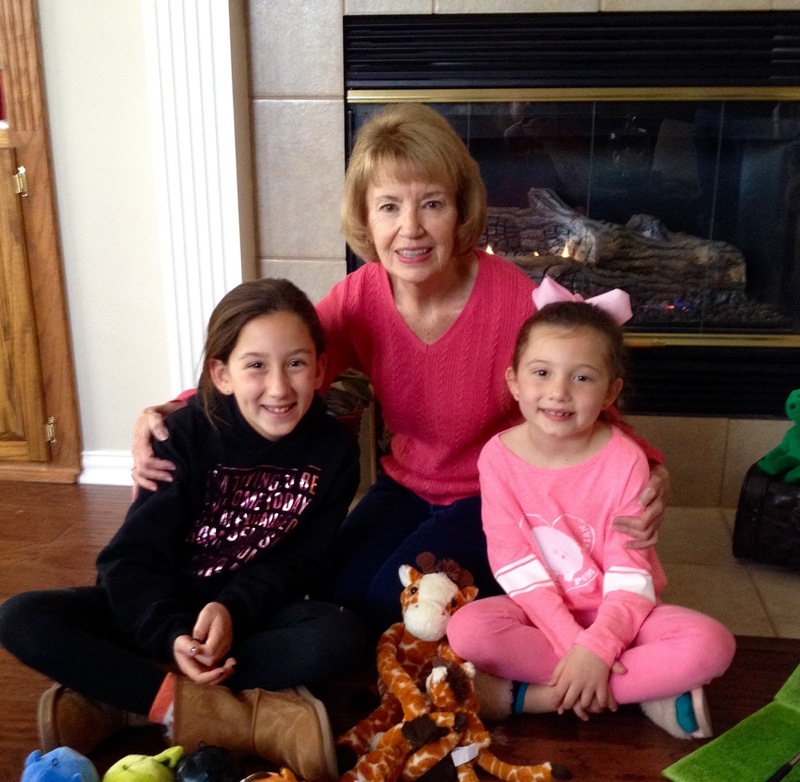 These sweet granddaughters, Avery and Ella came over to visit in the morning, along with my son, Tim, to celebrate my birthday. 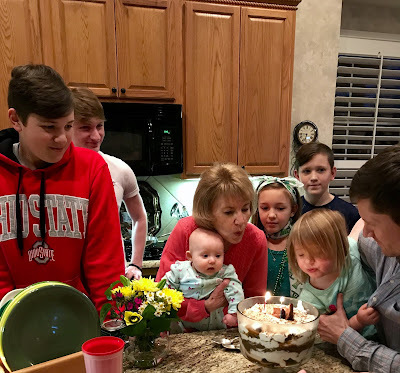 The rest of my family came over in the evening to celebrate. Riley is on the left, then Connor, me holding Hayden, Cissy, Caiden, and Harper being held by my son, Kevin. My daughter, Molly, made the fabulous Salted Caramel Brownie Trifle. It was a big hit!! My son, Mike, who lives here with me said the next day, "Mom, that party so much fun. It was like a holiday!" It really was, and I am counting the blessings in my life. 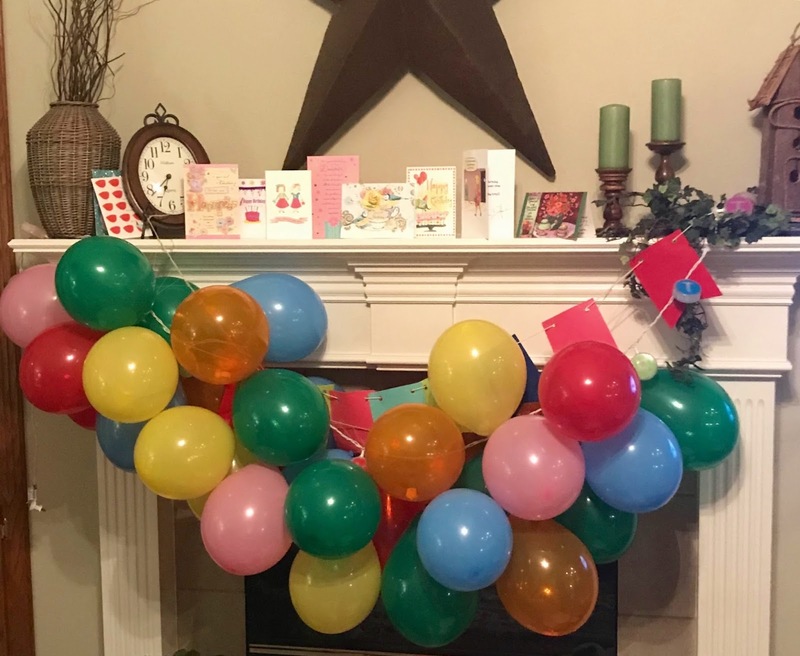 My daughter blew up all these balloons and had my family members write notes ahead of time, and then she placed them inside before tying the balloons closed. The kids took turns popping them and then I read the touching comments. We laughed, cried, and had the absolute best time. I saved all the notes, and Cissy later told me that if I'm ever sad, that I should just pick out one and read it. 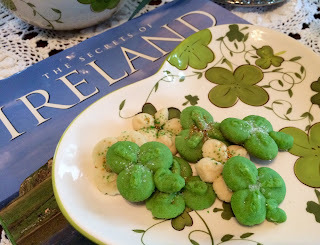 Cissy and I liked using this dough for the Shamrock Spritz cookies. I would advise making sure that you use a room temperature egg, or put an egg in a bowl of warm water for about 5 minutes, to bring it to room temperature. 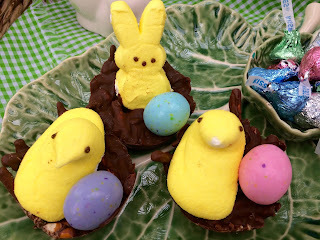 If the egg is cold, the melted white chocolate will harden and make it hard to get the designs out of the disc (not that I would know about this!). Melt white chocolate in microwave, stir and set aside. Beat butter, sugar and salt until creamy. Add egg and vanilla, mix. Gradually add in flour, mix until just incorporated. 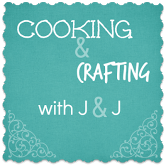 Press onto cold, ungreased, and NOT non-stick baking sheets. Sprinkle with colored sprinkles. Bake at 350 degrees for about 10 minutes (I usually start checking around 8-9 minutes).